Guterres met with Venezuelan Foreign Minister Jorge Arreaza in New York, at the request of Venezuela. During the meeting, the UN has called for serious political negotiations between the two sides to prevent a slide toward more violence in Venezuela. The bridge figured prominently in intervention related activities by imperialism to paint the elected government of Venezuela as hostile to the people, and build support for the US-backed self-proclaimed president Juan Guaido. The mainstream media stayed silent on Pompeo’s claim. However, independent journalists and observers revealed that, while the containers may have been placed by the Venezuelan government, the bridge was already blocked from the Colombian side. In fact, a cursory search online reveals that the bridge had never actually been open for traffic. The bridge was intended to connect Cucuta in Colombia to Ureña in Venezuela, spanning the Tachira river. According to local media, construction work on it was finalized in early 2016. By that time, Colombia had cracked down on its border with Venezuela due to the exodus of Venezuelans claiming economic hardship and famine in their homeland. Though Venezuelan border guards are not allowing the USAID vehicles in, both bridges remain open to cross-border traffic. So why would the US government and most Western media outlets claim the aid is blocked by showing photos of the never-operational Tienditas bridge? The propaganda is part of imperialism’s tact to manipulate public mind. It is part of a media campaign to delegitimize Venezuela. Venezuela’s Comptroller General Elvis Amoroso announced an asset audit on the accounts of Juan Guaido, the self-proclaimed “interim president” of Venenzuela. During a recent interview with RT Spanish Guaido made some startling statements. The fact is: On January 26, the UNSC indeed met to deal with the crisis in Venezuela, but it failed to reach a unanimous agreement. As the body noted in a press statement, the council members remained “divided” in their assessment of the situation on the ground. No resolutions in support of Juan Guaido and declaring himself ‘interim president’ of Venezuela were passed or even voted on. The latter is correct if only the most-recent round of sanctions imposed by the US on January 28 is taken into account. But Venezuela has been facing an array of restrictions since as early as 2014, when a bill authorizing sanctions against Venezuelan officials was signed by then-president Barack Obama. The first round of sanctions came in March the following year. US President Donald Trump stepped up economic pressure on Venezuela in August 2017 by banning financial institutions from dealing with the nation’s government and the state oil company PDVSA. Three more rounds of restrictions against Venezuela’s energy sector were imposed in 2018, including a ban on buying debt from the Venezuelan government. But his claims go against the assessment from the UN. The sanctions “are effectively compounding the grave crisis affecting the Venezuelan economy, adding to the damage caused by hyperinflation and the fall in oil prices,” UN Special Rapporteur and human rights expert Idriss Jazairy said just two weeks ago. Guaido claimed that he took on the role of the ‘interim president’ based on Article 233 of the constitution. 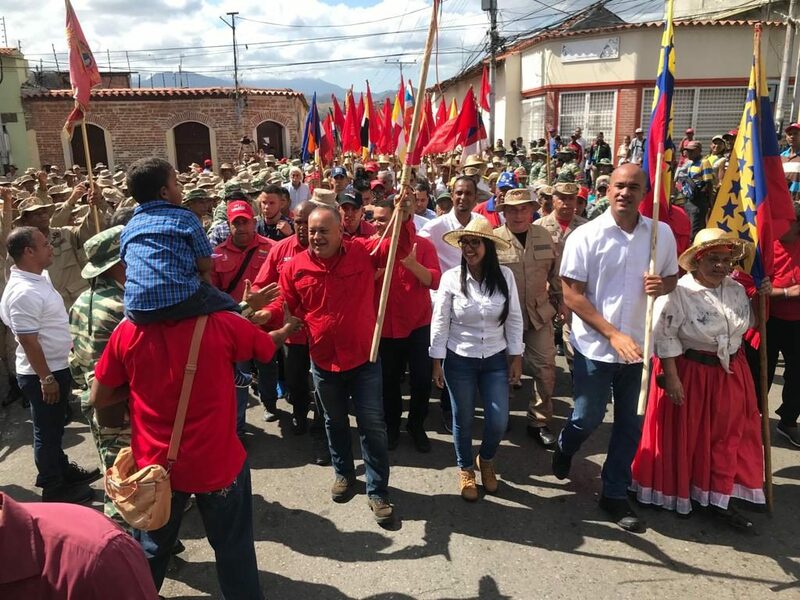 He claimed he had to do so due to the “lack of elections” as the opposition deems the presidential vote last May illegitimate although Maduro received nearly 68 percent of the votes. The article further says that if the president-elect can’t take office, a new election must be called and held within 30 days. Guaido refused to name the exact date of the new vote, despite being asked several times. He only gave a vague promise that it will take place after the end of the “usurpation” of power by the current government. Guaido alleged that ‘corrupt’ Venezuelan officials “have stolen $700 million” from the Russian oil and gas giant, Rosneft, which invested in several projects in the South American country. The Bolivian president continued on to denounce U.S. attempts to send aid to Venezuelans via the Caribbean and Colombia without state approval under the guise of a philanthropic gesture. Last week, both the International Red Cross and the Red Crescent refused to participate in the operation and override Venezuelan mandate. Bruno Rodriguez, Foreign Affairs Minister of Cuba, came out on Twitter to admonish the U.S. for its cynical use of a resolution in the UN Security Council pushing for “humanitarian aid” in Venezuela in order to get access to the country and continue its policy of intervention in the country. The Cuban Foreign Minister made a series of tweets that condemned the U.S. measures dubbing them as an “imperialist coup d’état. On Friday, Guterres officially recognized the representation of the Venezuelan Government – led by its Foreign Minister Jorge Arreaza – while rejecting the interests of deputy of the National Assembly (AN) Guaido. 23. Venezuela wants to double its oil sales to India and is open to barter payment arrangements with the world’s third biggest crude consumer, Venezuelan Oil Minister Manuel Quevedo said on Monday. Venezuelan President Nicolas Maduro launched the strategy “Marca Pais – Venezuela open to the future”, with which he hopes to boost tourism and bring to light the truth about the country, which has been attacked by a media war. “Much of the media war to which Venezuela is subjected in the world, has had as its goal that nobody comes close to Venezuela, that no one comes to invest, Venezuela being the best country in the world for investment,” said the president. The president explained that it is a win-win strategy, because the country wins with income and with the demonstration of its truth, and also win over public and private entrepreneurs. Alexander Shchetinin, the head of the Russian Foreign Ministry’s Latin America department, said on Monday that Moscow hasn’t received any such request from Caracas. Shchetinin strongly warned the US against making calls on the Venezuelan military to drop support for President Nicolas Maduro, saying it represented an “unthinkable meddling into foreign affairs of a sovereign nation”.